Sophisticated Design. The new console is approximately the size of three standard DVD cases stacked together, and it was displayed in a variety of prototype colors at E3. 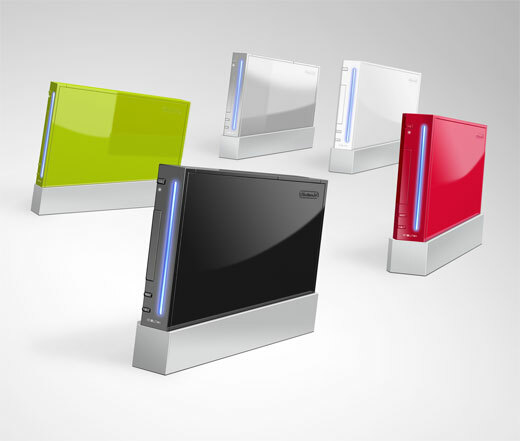 The console will come with a sleek silver stand allowing it to be displayed vertically or horizontally. Backward Compatibility. Revolution will play all of your favorite Nintendo GameCube games. An innovative self-loading media bay will play both 12-centimeter optical discs used for the new system as well as Nintendo GameCube discs. You can also equip a small, self-contained attachment to play movies and other DVD content. Huge Historic Library. Revolution will have downloadable access to 20 years of fan-favorite titles originally released for Nintendo 64, the Super Nintendo Entertainment System (SNES) and even the Nintendo Entertainment System (NES). Big Names. Nintendo announced that new franchise properties will be added to current super-star franchises including Mario, Zelda, Super Smash Bros., Donkey Kong and Metroid. Wi-Fi Freedom. A worldwide network of Nintendo players can gather to compete in a comfortable, inviting environment using Nintendo's newly announced wireless gaming service, Nintendo Wi-Fi Connection. - "strong 3rd party support"
Here at A-Z Cheats and codes we are working hard to bring you games solutions for all the latest Nintendo Wii games. Once a Nintendo Wii game is released, we try to have as many in game help on our web site for that game, within the first week. Action Replay Codes: Action Replay allows Users to obtain objects that are not obtainable during normal game play. Action Replay allows users to have infinite amounts of limited resources such as unlimited health, infinite lives, time, money, ammunition... Action Replay lets user’s access levels that are not normally available such as access to Level Warps, Invincibility and download game saves. Cheats: A cheat code is any method utilized by any game player to gain an advantage in a computer or video game. Code Breaker Codes: Code Breaker is a tool for modifying the play of videogames by unlocking various game modes and objects, using codes, usually for the purpose of cheating. Codes: Cheat codes are codes that can be entered into a video game to change the game's behavior. A common use of a cheat code is to skip to a level in a game, Easter egg or unlockable reward. FAQs: Frequently Asked Question about game play and in game objects. Game Guides: Guides Books are instructional documents that contain hints or complete solutions to specific video games. Guides normally contain; detailed gameplay information, complete maps of the game, which show the placement of all hidden items, specific locations, puzzles, enemies, bosses, collectible items. Strategy Guides: Strategy guides are instruction books that contain hints or complete solutions to specific video games. Walkthroughs: Walkthroughs are documents which attempt to teach a player how to beat or solve a particular game. Walkthroughs are often made by regular game players after they have completed the game. The walkthroughs are one of the best ways to help you through a game the easy way. Game Guides, Game Shark Codes, Hints, Strategy Guides, Tips and Walkthroughs. You can also send us any games solutions that you have unlocked that we dont have such as; Action Replay Codes, Cheats, Code Breaker Codes, Codes, FAQs, Game Guides, Game Shark Codes, Hints, Strategy Guides, Tips and Walkthroughs. Just go to our cheats - codes and walkthrough submit page and fill out the form (Submit a Cheat, Codes, Hints, Tips or Tricks, Guide).